Ex-wrestler El Padrino (The Godfather) stands in front of a chapel dedicated to Santa Muerte (Sacred Death), the folk saint who watches over Mexico’s poor and has been adopted by the cartels. El Padrino, a short, stocky man whose face is concealed behind a gold mask, watches as the steel framework of a large wrestling ring takes shape, a structure entirely in keeping with the heavy sky and concrete environment in Apatlaco, a working-class district of Iztapalapa, the poorest and most disadvantaged municipality in Mexico City. El Padrino is putting on a lucha libre match for his neighborhood to mark the Day of the Dead. Translated by George Miller. This essay is published through an exclusive collaboration between The Nation and Le Monde Diplomatique. To subscribe to LMD, go to mondediplo.com/subscribe. After his short speech praising Apatlaco and honoring the patron saint of outcasts, masked wrestlers somersault into the ring. Overexcited children crowd nearer, flanked by hawkers selling ice cream and masks. Behind them, adults are drinking beer. The athletic El Sublime, in a light blue mask, shows off his moves: body locks, counterholds, flying kicks. He and his partners Enigma and Skyder make up the técnicos (the “faces” or “good guys”) team, who fight by the rules against the rudos (“heels” or rulebreakers who fight dirty), who represent brutality and cunning. Rudos and técnicos have vied for Mexicans’ support for almost a century. The crowd in Apatlaco are backing the rudos. After a tough fight over three rounds, the técnicos concede defeat when bad-boy Aztlán (named after the mysterious mythic city whence the Aztecs began their migration towards the center of Mexico) ignores the referee’s helpless protests and jumps from the top rope of the ring, crushing his opponent to cheers of approval. In a few months El Sublime will stake his mask in a bout in Veracruz where the winner will tear off his opponent’s mask, the ultimate humiliation that can end a career. It’s common for large sums to change hands in advance to fix the outcome of a match, but in lucha libre, it’s the public who ultimately decide a wrestler’s fate. “I have to win,” Oscar says. Lucha libre became popular during Mexico’s post-revolutionary industrialization in the 1920s, when the country urbanized and developed. It originated among the chilangos, the children and grandchildren of migrants who came to the capital seeking a better life. Its most famous figure, El Santo (The Saint), also known as “the man in the silver mask,” was born Rodolfo Guzmán Huerta in Tulancingo, Hidalgo, in 1915; and before his family migrated to the capital’s El Carmen district, he had turned to a poor boy’s only hope of betterment: sporting success. Boxing offers this, but so does freestyle wrestling, which was popularized by visiting European wrestlers and by the creation in 1933 of the first professional company, the Consejo Mundial de Lucha Libre. This was also a fertile time for Mexican culture, partly because of the arrival of the cinema. El Santo appeared in illustrated reviews and magic lantern shows, and between 1952 and 1973 starred in over 50 films as the defender of widows and orphans against Martians, zombies, the mummies of Guanajuato, vampire women and media moguls. But after 40 years, he took his last bow, removing his mask for the first time on live television shortly before his death in 1984. Photographer Lourdes Grobet captured this golden age of wrestling. She shows the intertwining of the ordinary and the mythic, male and female wrestlers in their fights before a transfixed crowd of sin-calzones (as the wealthy call them; it means “no underwear”) and the splendid arenas, symbols of architectural modernity that look in her pictures like places of worship. She has been publishing her work for 25 years, an avant-garde testament to the “theology of lucha libre,” as the late writer and poet Carlos Monsiváis describes it in his foreword to Grobet’s book Lucha Libre. Monsiváis holds that the high point of lucha libre was also that of Latin American popular culture: “Its Golden Age dialogues with other Golden Ages in cinema, bolero, tango, Peruvian waltz and ranchera music…. an urban sensibility that begins with pride in one’s barrio and ends up transforming that boastfulness etc. into an individual capacity to survive.” The popular should be understood “not [as] the opposite of that which is aristocratic or bourgeois,” but rather as a response to the “institutionalized invisibility” of the anonymous masses. Lucha libre is now becoming popular with the educated middle class. The first university conference on it was held in Mexico City in September 2014 and dozens of theses have analyzed it using Marxism, situationism, and queer theory, seeing in its kitschiness and masks a postmodern construction of multiple identities. A new category of wrestler has joined the técnicos and rudos: transgender exóticos, who wear make-up and dress as women. Cassandro, an exótico from Ciudad Juárez and 1992 world champion, has become an international gay icon. “Lucha libre used to be looked down on and thought of as a low form of entertainment. People thought it was for ruffians, beasts,” historian Orlando Jiménez told me. “Now it’s a symbol of modernity.” Jiménez, an expert on lucha libre and an occasional referee, believes this change reflects wider transformations in Mexican society, especially the growth of mass media. “When television arrived in 1954, wrestling was banned because it set a bad example for children. Then in the 1990s, TV imposed conditions on fighters at a time when the unions were breaking up because of corruption.” These unions, the first of which was set up by El Santo, had previously backed the wrestlers against the promoters, given them status, and demanded medical control of the sport. But they limited their activities to Mexico City’s two large arenas. Lucha libre’s new promotional body, Asistencia Asesoría y Administración (AAA), established in 1992, organizes bouts in Mexico, the United States, and Japan. The Triple A benefited from the deregulation of television in the 1990s and helped develop the sport on the US model, with bodybuilding luchadores, giant screens, cheerleaders, and dwarf fights. This has forced lucha libre to adapt its style to television, scripting the drama for the cameras rather than the public. The death on live TV of well-known rudo El Hijo del Perro Aguayo (Son of the Dog Aguayo) caused profound shock. He died of cardiac arrest after a flying kick from his opponent in Tijuana on March 21, 2015. His dying moments were filmed in close-up while the show went on. The accident showed how vulnerable wrestlers are; despite being the ultimate symbols of Mexican machismo, almost none have any social security or medical cover. He believes lucha libre has always possessed strong political symbolism, “the symbolism of the social.” From Zorro to Subcomandante Marcos of the Zapatista Army of National Liberation, the mask has been a popular accessory. Many wrestlers are prominent in the social struggle, such as Fray Tormenta (Friar Storm), the priest who took to the ring to fund his orphanage, which he made a training center for future wrestlers. 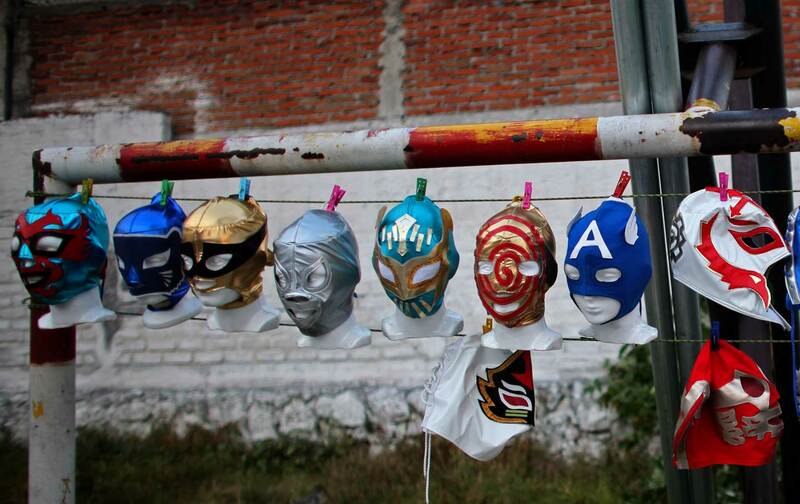 Lucha libre has also inspired activists looking for symbols of unity. Benjamin FernandezBenjamin Fernandez is a journalist.